In Part 1 of our notes on the ROG crafting system, we talked about the types of resources, their extraction and processing system. Now we shall talk about the Count’s role in this process. If you read our article about the circulation of Talers, then you probably know that a Count can directly influence the trade tax rate collected from operations in his county. A Count also establishes the county maintenance costs. 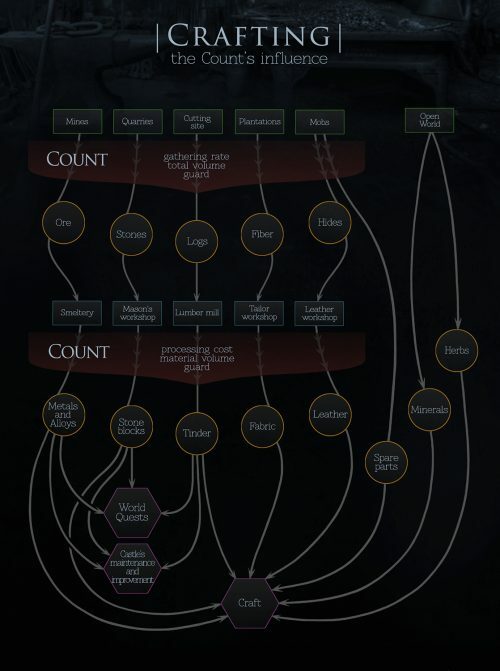 To explain the Count’s role in the system of gathering and processing of resources, let’s look at the diagram. First of all, a Count is in charge of gathering facilities. It is his money that wages of workers are paid from, tools are made and gathering facilities are maintained at. Moreover, a Count pays to the gathering facilities’ guards responsible for the safety of workers and players. An effective worker is a full worker as we believe at Atlant Games. That is why the amount of gathered raw materials, as well as their gathering rate, will depend on the count’s financing this industry. If a Count does not support the mining industry with money, NPCs do nothing, the hillock is sitting cross-legged. As a result, not only the gathering volume falls multiply, but also the raw materials respawned at the complex are scattered around its corners and players will have to collect them manually by hand. If a Count supports the mining industry with funding, then besides raw materials scattered around the gathering complex, NPCs will stack additional raw materials at the entrance as they are gathered. Of course, anyone can take them. The next logical step is processing of the gathered raw materials at processing stations. Workers of processing stations also need wages. The cost of processing resources and the volume of refined materials depends directly on how a Count finances the industry. At low financing, NPC workers of processing stations will take a part of the refined materials for further shadow sales as a commodity. Of course, players can immediately redeem them, but, agree that this is not what a player, who dragged several tons of raw materials for processing and killed some robbers along the way for saving his caravan, expects. The power of NPC guards at the gathering and processing facilities also depends on the amount of costs allocated for guarding. At maximum funding, it is as safe there as in the city. But, of course, there are things that function according to their own rules. They are slightly to the right on the diagram. Minerals and herbs appear randomly in the open world, neither a count, nor a king, nor an evil GM can affect these types of resources. Spare parts and hides are also obtained a little differently. Players obtain them by killing mobs. At that, the use of spare parts in crafting does not require preliminary processing, so a count does not profit from this kind of resources. But a count affects the number and speed of mobs respawning, free of charge, so to say. Such regulation will not allow him to run a county completely without mobs, as there will always be a basic minimum, but it allows a count to increase the number of mobs. Similarly, with the rest areas of his control. Thus, each Count independently determines the level of costs for the industrial complex in his county. Large costs can stimulate the influx of players into his county, make it comfortable for living and stimulate the volume of trade. Small expenses can completely kill the economy of the county and result in the fact that players will leave the despot alone with his income close to zero. What will it result in? The answer is clear. At such system, everyone in the county will be able to feel the influence of the count's policy and make up their mind about the ruling regime. Please, join discussion of Count's role in crafting system on our Forum.